Livorno's cuisine is mainly based on seafood with the addition of inexpensive but wholesome inland ingredients, a cuisine full of aromas and tastes, where fish is the absolute star. The gastronomy is also characterized by the city's strong ties with its history, made of different peoples and cultures who lived in Livorno for many centuries. The most famous dish is cacciucco, a stew with various types of fish (at least five) with garlic, tomato, red pepper, parsley and toasted bread, other first courses include soup or pasta with mussels and rice with squid ink, a true delight. For a tasty snack do not miss the torta di ceci, a focaccia made from chick pea bean flour and eaten between two slices of bread. Lastly a curious fact: the Jews from north Africa brought cuscussù to Livorno, a particular version of cous-cous. Entrees are also based around fish: classic recipes include mullet "alla livornese", cooked in tomato sauce with garlic and parsley, or dried cod "alla livornese". Fish lovers will be embarrassed by the selection of shellfish, squid, bream and calamari, prepared in a variety of ways. Braised lettuce and artichokes and cauliflower with slices come from Livorno's Jewish tradition. Inland beef predominates, of the top quality "chianina" race, and naturally wild boar. Some of the typical sweets are also Jewish, like roschette, Passover cookies and schiacciata di Pasqua, an anisette flavored cake. To finish a meal in the Livornese tradition, nothing is better than a glass of ponce. This is Livorno's version of punch made with coffee, rum and lemon rind. 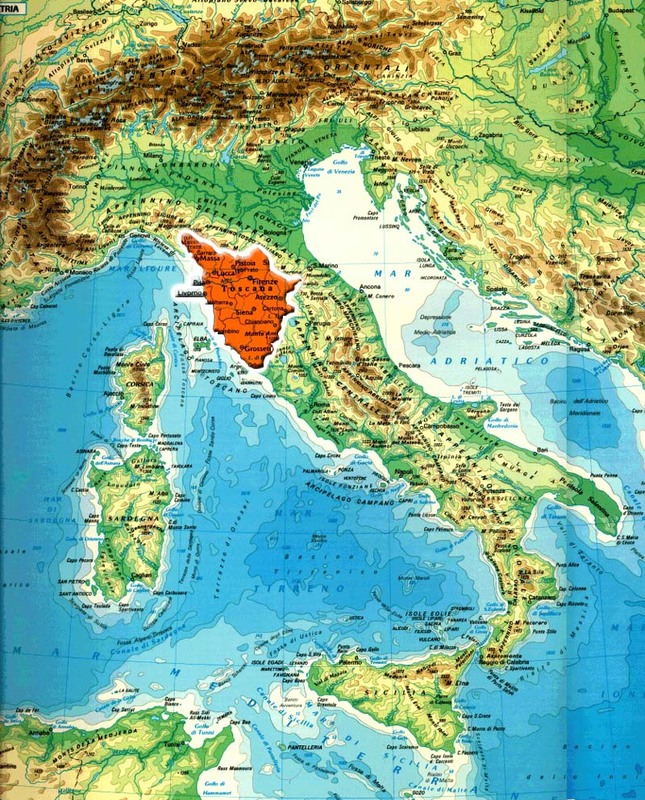 Wine: the Etruscan Coast is home to the DOC areas of Bolgheri, Val di Cornia and Montescudaio, which since the 1990's have been gaining international fame thanks to prestigious labels like Sassicaia and Ornellaia. In addition to these famous "Supertuscans" more affordable reds include Sangiovese, Cabernet and Merlot. Whites include Ansonica, Vermentino, Sauvignon, Chardonnay and Aleatico, an excellent after dinner wine which goes well with pastry.